Replies: 28 (Who? ), Viewed: 11166 times. I'm working on a big world (huge map, around 150 lots), and I'm very close to finaly finish it but there is a setback. After adding few large lots saving in EiG became unstable and often crash. Eventually this lead to messed up routing (I posted some picture in tread about it). Now, I do have a back up with normal routing and I can solve this without losing too much time but I want to check something first. While I was checking older versions for routing (to track down where it started) I looked at the version I cleared from lots and trees (demolish lots in EiG, and delete layers in CAW), and realized there are 4500 game objects listed in General Layer. I can only drag them one by one into other layers and delete them from there but they return after saving. Position of all is -20000 on all 3 position and there is no shape visible, just a framework, if I change coordinates, the are still invisible in all views. Apparently they are tied to lots but having no lots in world makes me confused about what can I do. I checked some other worlds I was working on and all have objects there (less than this one but still have them). I'm now wondering if these objects are possible to remove, and if they may cause lag in game, which I'm working hard to avoid. This leads me to a second question - out of despare I'm looking for tutorials for height maps (hopefully I find something usable) and noticed someone mentioned roads and bridges etc. My question is doesn't the height map transfer only rough terrain shape while I still have to smooth it and add final touches, paint everything and add all the roads, objects, trees, effects (everything else really)? I'd really like to clear this world to make it playable and those objects are making me very be very cautius, specially with all the crashes and messed routing in almost finished world. Please help Thank you! I'm working on a big world (huge map, around 150 lots), and I'm very close to finaly finish it but there is a setback. After adding few large lots saving in EiG became unstable and often crash. Perhaps this is a problem with your install- I've seen several people have an unstable game where they have unpatched EPs, or perhaps a version mismatch. Could you please post the SKU versions of each SP/EP, just to check? For the objects on the global layer- I have a feeling some of these might be to do with spawn points, but it's hard to be sure. In my very large and complex world I have 4500 objects on the global layer- but most of those are lot objects, as I have >150 built lots. I would be tempted to leave them alone, we don't really know enough about them to know if they are a result of an error or even if they will cause lag. For the heightmap question, yes- the heighmap contains only the 3d data for the world terrain shape. All objects that are placed on layers are contained within that layer file, not in the heightmap. The only thing you can't really copy over (or at least, I've not found a good way) is the roads. Thank you simsample for such a detailed answer. I do believe that CAW crashing is related to only 2GB of RAM I have, specially since it started to happen when I put some huge lots in it, and continue to do so even after clear reinstall with registry cleaning. My processor is Intell 2.4GHz Core to Duo, and can handle it, but I'm lacking RAM. Still, I do like the idea of having a large world playable for those with not so awesome gaming machines. About general layer objects, I couldn't delete them, it said they are tied to lots and I should edit them in EiG, but I already deleted all lots in that version of the world and that is what was strange. And thank you very much for the info about paint layers and for objects. I did use them and it will be a huge help if I don't have to repaint everything, and not to mention replacing objects! Very helpful, thank you. WA, HELS, FLS, LN, and OLS all have patches, which you don't have. For normal gameplay this doesn't seem to matter, but we've seen that CAW seems to balk at outdated versions so it would be worth patching to see if that makes any difference. Also try it with all nonessential CC removed, as that will help maximise your resources. Again, sorry for late answer. Lowering all settings on minimum and pointing camera into not so dense area helped as well as saving when I move from Editing lots in EiG and Live mod in EiG. I don't use CC at all, rarely even patterns, specially while building this world I uninstalled everything that was not directly related to it. I did encounter another problem which now makes me crazy. I find out that the master controller can list me all the stuff in household inventories and on lots / and I can delete everything I don't want / it was important to keep it on EA level. But when I do that *too much books and some LTR and stuff I didn't want there I wasn't able to save it and after several attempts One family got corrupted and I had to go back to previous versions and gave up cleaning household inventories like that. Another issue was around hour long saving time and with a job and small kid I rarely had time to stare at PC blinking gray&black for that long While I was trying to save with cleaned household inventories my PC crashed instead of just game, and eventually it messed up bios and it was a struggle to return everything back to normal. I'm guessing it was too much for my poor PC to handle but it was very helpful to check and clean the lots from unneccessary and unwanted objects. Also, I copied general layer from previous versions where I had just few hundreds objects and when I started to place lots numbers increased accordingly. It probably is some sort of cashe for objects used in a world as someone already mentioned it. Thanks for the info, Anushka- it's good to know you found some solutions. I'm not sure if this thread is the right place, especially since it hasn't been active for a while; still, I have been busying myself a bit with these mysterious objects on the general layer and thought I'd share my (very humble) findings with you guys. The reason I got interested in them in the first place was that invisible though they are, they seem to account for some of the file size of a world. Also, I really object to the idea of having anything in my custom world which I have not the slighest idea of concerning what it is, how it came into being, and what it is doing behind my back ;-) So I've been experimenting a bit, and these nameless objects seem to be connected to lots sure enough, although mostly, they do not seem to denote any 'real' object existing on a lot. They're always placed at x, y, z -2000, as has been noted before. The really uncomfortable thing about them is that they stay in the world file even if all the lots have been deleted - you can sort of never get rid of them again it seems. I tried every way I could think of, for example, deleting the lot content in EIG, but the lot itself in CAW vs. deleting both in EIG, and so forth. No matter what I did, these strange objects remained in the general layer. I tried to figure out whether they were connected to certain types of objects being present on a lot, windows, doors, fireplaces or whatever. I used a completely empty world (with a completely empty general layer as well), plopped down a lot, went into EIG, built a house with just walls, foundation, and roof. Went back into CAW: lot there, no strange object on the general layer. Hm. Next try, new empty world: House built in EIG, with three different windows added (base game, EP, and cc). Result in CAW: no objects in the general layer. But when I tried almost the same thing again, built a house with just walls, roof and windows, and added a door, bang! - one object appeared in the general layer back in CAW. But it was NOT the door, it was of another shape altogether. Okay I thought, maybe it's still related to the doors for whatever reason, but of course, CAW being the malicious little thingy it is, next time I tried with the house with windows only, sure enough an object appeared on the general layer. WTF?! And, generally speaking, why are there any lot-related objects present in general layer at all, if all the build/buy things are already in the lot layer? 1) These objects are not present if there have never been any lots in the respective world. 2) They never disappear again, as far as I'm aware. 3) They always seem to be generated if you insert houses taken from the LIBRARY into your world, no matter if these just consist of some walls and a roof and nothing else. If you create a house in EIG instead, sometimes they are not being generated. 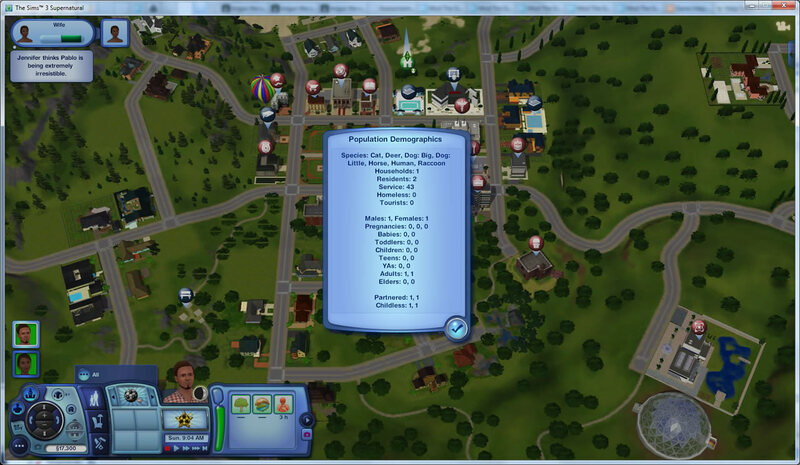 4) I believe some of them could also denote Sims if it is a world which had been prepopulated originally. 5) There seem to be two general sizes of them, one rectangular shape lying flat on its back, one rectangle standing upright, sort of like a thick doorpost or something. 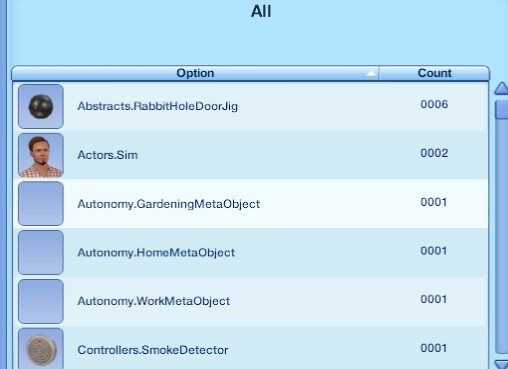 6) Although these two general object things do not seem to be connected to anything specific on a lot, or a specific type of build/buy objects or something, sometimes there are other objects present on the general layer which are indeed specific lot objects - they seem to get left behind when deleting lots. For example, I found a number of general layer objects in one custom world I depopulated and 'de-lotted' before that were the little figures in a Gnubb game. Well I've run out of ideas for now what else to try to figure out what it is these creepy invisible rectangles actually do; but maybe someone else wants to get started on them as well? Tiinii, thank you for your research! This is most interesting, I will definitely take a look at this next time I'm working with CAW. In the mean time, I'm hoping others will see this and post their findings, too! For the EA Worlds, I suspect that they work on their worlds by assigning each 'region' of a map to a team, who build that region on a single layer. Then, at the end, all layers are spliced into a clean copy of the world. This makes sense if you look at the EA worlds in CAW, as they are split into areas with lots, trees and deco on a single layer. Ah, but if you are splicing a world together from many different layers, there is no need to save it again in CAW! You can even splice layers/ resources into a world file and then export it without having to open it or save it, so the possibility is there to create a 'clean' world, if this were to work. Routing can be done by assembling a version of the world, calculating routing and then importing the routing resources to the clean world file. So you see that because we are getting more familiar with the resources in a world file, and understanding what some of them do, we have more power with CAW. Yes, I think you're right- it does seem to be some kind of error in CAW. I was thinking about this recently, and noticed that a new world with just two lots had several global layer objects. One of the lots had the pesky gnubb set and the other had a city hall. I've noticed before that those gnubb sets never work correctly if you place them on a lot you include with a world- the jigs seems to get messed up and the sims play the game at the wrong angle for some reason. So perhaps this is partly why! "Bogus Inventory Item" logs are the result of ErrorTrap locating an object that is supposed to be in an inventory, but the inventory itself has been removed from the game. Normally this is the result of cleanup due to CAW errors in custom worlds, however it will also occur during regular play as well. Of course, the gnubb set is 'portable', so can be carried in the sim's inventory! So maybe we are learning to keep away from gnubb sets in CAW/EIG. I have a whole bunch (4000+) of them in a large world I made, and they don't seem to cause any problems in gameplay. I've been playing the world for 5 sim generations now with no trouble. That's rather fascinating, Simsample, thanks for the link to the other discussion thread as well. Yes, I figured too that the Gnubb set was one of the culprits, because I've seen it behaving weirdly in a custom world I tried to remodel. And from what you write, obviously a number of the strange global layer objects must be those forwarders of the Gnubb set. On the other hand, I've seen these white boxy objects appear in worlds which never had any Gnubb set, or any other portable/Inventory item. And this object stats list you included, doesn't it seem to hint that maybe stairs could be responsible as well? Because they are shown as a white box? Generally, my problem right now is that I am building my own custom world, not to upload, just to play for myself, so I'll have a place with as little bugs and glitches as possible - well, and these global layer objects have so far prevented me from placing any fully built lots via EIG, because I don't know what they will leave behind if I decide to take them out again. I'm sort of longing for a clean, pure little world with no weird issues, know what I mean ? One in which I can finally just PLAY and nothing else. Thus, even if they don't really do anything, I don't want them there, because I don't know what they COULD do, and also if they are eating up resources / enlarging the file. It seems that any work you do to lots- whether it is placing a library lot, editing an existing lot or moving a lot- in EIG mode will slap unknown items onto the global layer. Very annoying! Someone on another forum had a streetlight stuck under the ocean that appeared to be on the global layer, so I wrote a tutorial for how to clean the Global Layer, as it was on my list since this thread. It's the same as the tutorial for splicing layers from another world, except that you have to hex edit a slightly different resource, since the global layer is defined in a different place to the other layers. If you keep a copy of the clean global layer you make then you can just copy-paste it back into your world if you ever need to edit it and 'dirty' the global layer again. I'd be interested to know if this works for you; it works fine in the worlds I've tested it in, but of course I need to know if there are any potential problems! So if you feel like trying it, I'd appreciate it. 00000100: 62 6A 65 63 74 47 72 6F 75 70 44 61 74 61 03 08 : bjectGroupData..
00000190: 79 73 74 65 6D 2E 55 49 6E 74 36 34 00 20 00 21 : ystem.UInt64. .! 000001C0: 31 00 0C 53 79 73 74 65 6D 2E 49 6E 74 33 32 00 : 1..System.Int32. 000001D0: 00 0D 53 79 73 74 65 6D 2E 4F 62 6A 65 63 74 7F : ..System.Object. I have no idea what that means, and no idea why it's not in the LITE worlds (unless of course, they stripped it out and CAW will put them back when you save). For the EA worlds, it's hard to tell what would have been contained in the global layer, since we have to simulate that anyway in order to unpack those world files. So, maybe the Global layer is just a placeholder of some sort, or perhaps merely used in order to differentiate a packed file from a non-packed file. Or maybe it actually does have an important function, but I'm just not seeing it! Thanks simsample, I've always wondered about the roads! I've played some with replacing the global layer, and so far, it works like a charm and isn't half as complicated as I feared it would be! Apparently, it also doesn't cause any problems for the lots in the world. I'll keep on testing some more though, because I'm having trouble with one world where I did this, but the trouble can be due to a number of reasons. I've also found out that if you put in a clean global layer, you can delete occupied lots (with houses, I mean) just like anything else in CAW, without having to call up EIG, which is just great. I shall make a little thread on this I guess, so others know, too. Good information, Tiinii! I've been testing the clean global layer with so far no problems, although I'm not sure there are any real benefits either (apart from being neater). I might have to try this out. I recently noticed a large number of objects in the Global Layer of my custom world I am working on. A lot of them appear to be the Dr. Pepper deckchair for whatever reason. Like Tiinii, I don't like the idea of my game doing things I'm not aware of that could potentially cause issues. And it's not only the potential problems they might cause, they also do add to the file size. For me, cleaning the global layer has worked without any trouble so far, hope the process will help you there too, Menaceman. Otherwise, do post please, I'm still really interested in this weird business! Quick question: Has anyone tried this with a populated world? I noticed that instances of sims in populated worlds tend to appear as objects in the global layer, and I'm worried that if anyone with a populated world tried this they could (a) strip the sims out, which isn't a big deal (b) strip only parts of the sims out and do something corrupting and messy. Something to keep in mind, and perhaps something to test. It could be that splicing in a clean global layer should only ever be done prior to populating a world using the existing methods. I've just done it on Sunset Valley with the routing fixes. Since there was an issue with Lot tears, that I'm looking into anyway. Once I release this version "into the wild" we can get broader feedback on what impact cleaning this up has on a populated world. And by the way, @simsample, your tutorial on cleaning the layer works like a charm! Edit: That all said, if we can learn how sims are stored in the global layer we might develop a tidier method for getting them into worlds, alongside actually getting ghosts in. EIG and CAW's fundamental inability to instantiate ghost sims tells us that EA has another method. simsample's suggestion of splicing in the global layer - or something like it - would make a lot of sense. 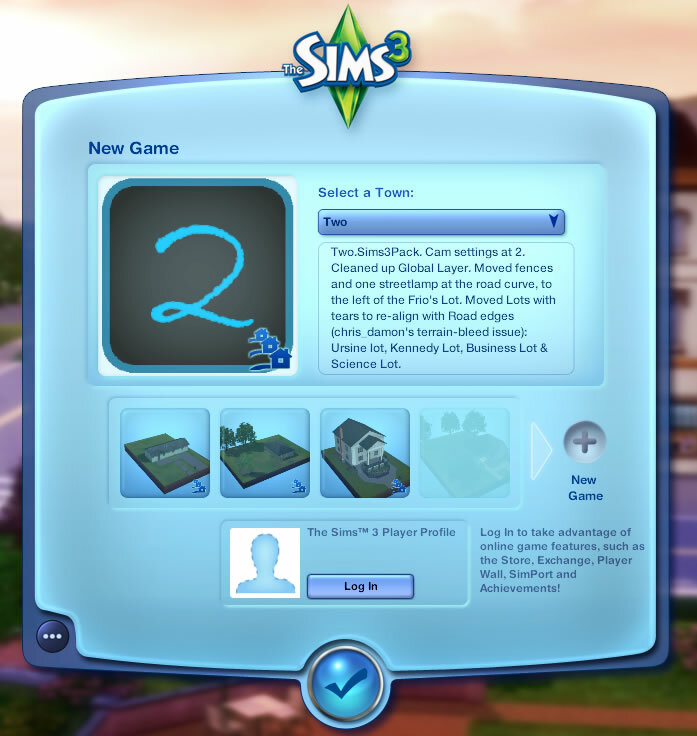 Edit: Opened the global layer in S3PE and there are the snap files for all the sims portraits, plus a bunch of resources I'm not qualified to name. Having a look at the wiki file types list to identify some of them. 0x06CE4804 - Meta data, no page for this on the wiki. Well. I don't know whether that's helpful or not. It was to me, but more experienced types have already had a look. 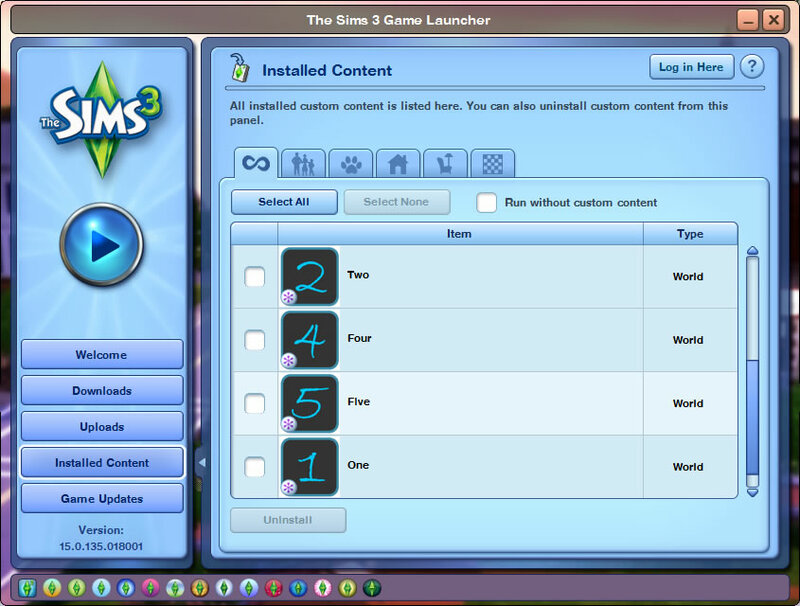 Very helpful, Kiwi- I did test with the EA populated worlds, but of course the sims are stored in the world file for those (you'll see the SNAP and sim resources in the world files if you open them, and then there is the xml file to initialise them). I'll add a note in the tutorial to mention about user populated worlds. Edit: Added a big red warning! Uh-oh! 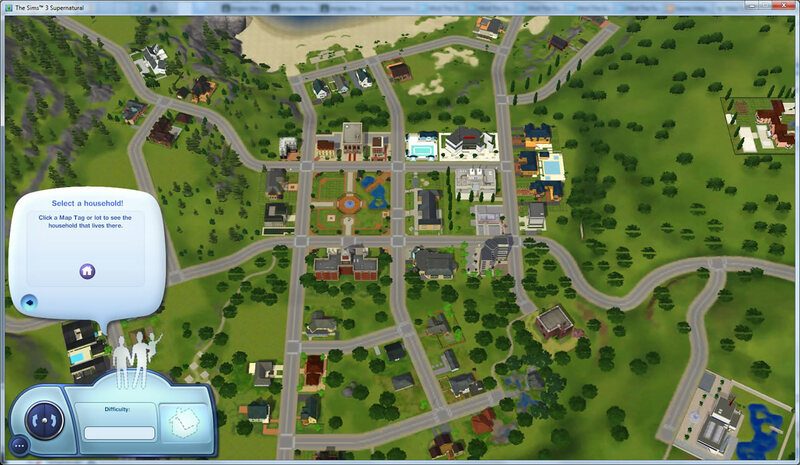 I just tested with an exported Sunset Valley version, and yes, no Sims! Images to confirm population numbers with MC. Hehe, aren't my world names oh so creative? Might this be the definitive way to create a de-populated world? As all other versions I downloaded always have some of the population stuck to the world and it is not 100% EA-pudding-free. So now, I have to think on how to incorporate the changes with a clean layer and a cleaned up (well, minimized really) Lot tears to EA worlds without any other destruction.